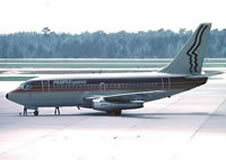 People Express Airlines (aka PEOPLExpress) was a low-cost carrier that operated from 1981 to 1987. The company was started by Don Burr, who resigned from Frank Lorenzo's Texas International in order to do so: Burr was influenced by Freddie Laker 's forays into low-cost air travel during the 1970s. Terminal space was leased at Newark Airport's long abandoned North Terminal. The upper levels were used as corporate headquarters in order to save money. People Express was launched on April 30 , 1981 with service from Newark to Buffalo, NY , Columbus, OH , and Norfolk, VA . Despite an accident at a neighboring Conrail freight yard that year, which caused an evacuation of the North Terminal and shut down the airline's operations on July 22 , People Express grew rapidly, adding flights to Florida by the end of the year. 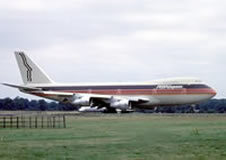 On May 26, 1983, PEOPLExpress began non-stop service from Newark to London's Gatwick airport with a leased Boeing 747-227B previously operated by Braniff. Flights were priced at $149 each-way and upon launch, became an instant success with all flights sold-out for several months within 24 hours of being offered. In 1985, People Express bought out Denver-based Frontier Airlines. The combined company became the United States' fifth largest airline, with flights to most major U.S. cities, as well as an additional transatlantic route to Brussels. During this period, People Express also purchased midwest commuter carrier Britt Airways and Provincetown-Boston Airlines (PBA), a regional airline with route networks in New England and Florida. The aggressive purchasing spree placed an enormous debt burden on the carrier at the same time major legacy carriers' improved yield management schemes enabled them to compete better with People Express on fares. Furthermore, integrating Frontier's operations caused labor struggles with the newly absorbed airline, and the change to a low-fare, no-frills mentality alienated Frontier's passengers. Debt pressure on the carrier forced a change in philosophy, as People Express sought to lure business travellers who were willing to pay higher fares. Aircraft cabins were redesigned to include a first-class cabin, a frequent flyer plan was initiated, and the simplified fare structure was abandoned in favor of a more traditional airline industry "revenue management" pricing scheme. The failed integration and enormous debt stretched People Express too far, and in June, 1986, the company announced it was working with an investment bank to seek buyers for part, or all, of the airline. A deal to sell Frontier off to United Airlines fell through due to the inability of United to agree to terms with its unions on how to incorporate Frontier's staff, leading People Express management to cease Frontier's operations and file the subsidiary for bankruptcy protection. In the end, People Express was forced to sell itself entirely to Texas Air Corporation for roughly $125 million in cash, notes, and assumed debt. Due to concerns about regulatory approval for the purchase, Texas Air purchased the assets of Frontier from People Express in a separate transaction worth $176 million. People Express ceased to exist as a carrier on February 1, 1987, when its operations were merged into the operations of Continental Airlines, another Texas Air subsidiary, under a joint marketing agreement.